Stinson documentation and manual area created 4/15/01, Last updated 12/30/01. Some confusion seems to exist about Stinson documentation and manuals. 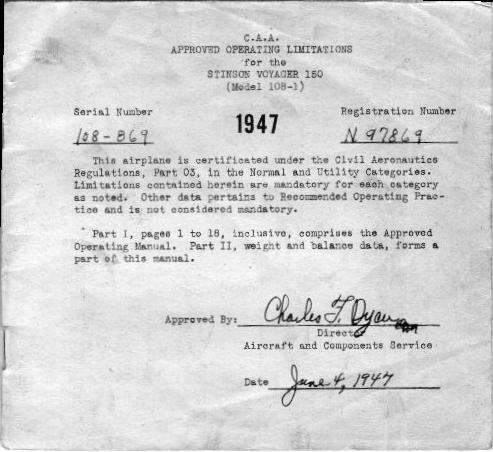 FAA documentation required to be in the airplane before it can fly legally consists of 1-the Stinson 108 Airplane Flight Manual (NOTE - this is NOT the owners manual), which includes the aircraft equipment list, 2-a weight and balance report, 3-the FAA Airworthiness certificate, and 4-the FAA registration certificate. If the airplane has been altered since it was manufactured, almost a certainty by now, then documentation which shows the updated equipment list and the current weight and balance (most often the FAA form 337), must be in the airplane showing the correct current equipment and weight and balance. The above 4 items are the minimum to fly the airplane legally. If the airplane is equipped with a FCC approved radio transmitter (each Stinson was delivered with a radio transmitter/receiver, but those radios are no longer approved for use by the FCC) there must be a FCC radio station license in the airplane to use the transmitter. Log books, one for the airframe, one for the engine, although required, do not have to be in the airplane to fly it legally - BUT they must be made available if requested of the FAA. Personally I recommend keeping photo copies of each page of the log books in a safe place (at your home for example), with the original log books kept in the airplane. Another item which is not required is the Owners Manual. I'd certianly recommend having an owners manual in the airplane, but it is not required by FAA regulations to fly the Stinson 108 legally. At the top left in the image is the airplane flight manual (this image shows the flight manual for the 108-2 and 108-3, see below for the 108-1). This document is 8 1/2 by 11 inches in size and is 4 pages long (2 pages printed on both sides) - the flght manual MUST be in the airplane when flown. Each airplane delivered by Stinson included its own unique flight manual which included the equipment list for the specific airplane. Also included in the airplane flight manual is the limitation chart for permissible weight and balance, required placards, etc. 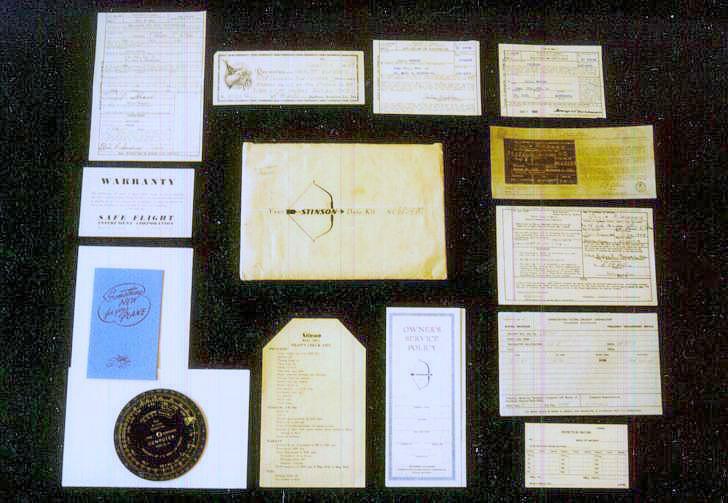 Shown at the top right is the weight and balance document provided by Stinson for each specific airplane, again 8 1/2 by 11 inches in size, 1 page only. 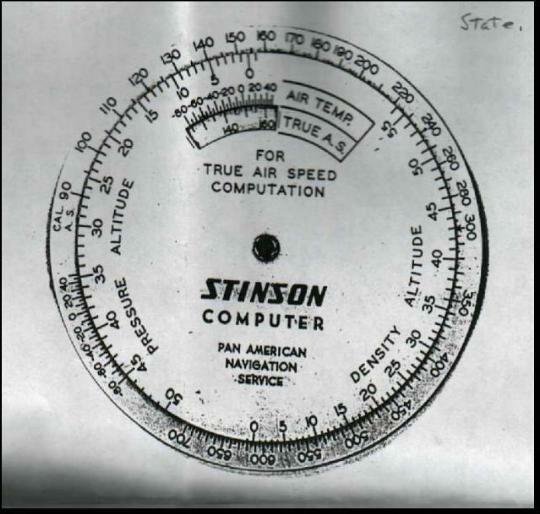 These two documents form the basis of the equipment installed in a specific airplane, plus the weight and balance for each specific airplane as delivered by Stinson. When a mechanic adds or removes a component, a radio for example, the equpment list information and the weight and balance information for the airplane must be updated. Most common method to update this critical information is the use of the FAA form 337. Virtually every Stinson 108 airplane flying today will have one (or more probably several) FAA form 337's which update the original equipment list of the airplane, and replace the weight and balance data with data corrected for the changes made. You MUST have in the airplane during flight the latest weight and balance report. NOTE - when a certified airplane such as the Stinson 108 has a major repair, or is altered such as a radio change, an FAA form 337 is required. A licensed Airframe and Powerplant mechanic must sign the form as mechanic, and the work must be inspected by an individual who holds both an A&P and has an Inspection Authorization (IA) from the FAA. In certain cases, such as installing a part which does not have a Supplemental Type Certificate approval for the Stinson 108, the FAA Flight Standards District Office must also approve the form 337. In some cases, where the work is performed by a FAA Approved radio shop for example, that shop may use a different form approved for that shop by the FAA. Two other items are shown in the image, the owners manual and an inspection form. The owners manual shown (yellow cover) is an original 1948 model manual. Manuals from other years have different covers, with the contents specific for that year. Last, at the bottom center, is a standard Stinson 108 inspection form for 100 hour/Annual inspections. It is not required but often found with the airplane paperwork. The image above is of a 108-1 flight manual. The image shows an original flight manual I purchased on eBay for 108-1, serial number 108-869, N97869. This particular manual is about 6 inches wide and 5 inches tall. I have a photo copy of another 108-1 flight manual, serial number 108-1580, N8580K. The photo copy of the flight manual for the later 108-1 appears to be standard size 8 1/2 x 11 inches in size. N97869's manual is 27 pages long, N8580K's manual is 12 pages long. One major difference between the 108-1 flight manuals and the later 108-2 and 108-3 flight manuals, is they include graphs for takeoff, landing and other performance characteristics. In my opinion I like the graphs provided by 108-1 flight manual better than the limited info provided by the later 108-2 and 108-3 flight manuals. Stinson 108-1 flight manual info added 9/05/01. When Stinson delivered a model 108 airplane they included a 5 by 8 inch white string tie envelope with each airplane. This envelope is called "The Stinson Data Kit." The actual envelope is shown in the center of this image with the Stinson logo. At the top left is the FAA Bill of Sale document. This document is required to register the airplane. To the right of the FAA Bill of Sale is a hand written receipt for payment of the airplane. Remember Stinson 108's came off the production line before the age of computers and laser printers. Next to the right (second from right on the top line) is the application for aircraft registration, completed at the time of sale. At the far right on top is the actual FAA Registration form as issued by the FAA to the owner. The four documents on the right, below the aircraft registration, are a FCC applicaton for radio station license, the FCC radio station station license (this original FCC transmitter license authorizes Stionson 108 owners to transmit on either 3105 or 6210 KHz), the radio technician's report on the actual measured frequencies of the radio, and a card showing the frequency installed in the radio (both type original radios installed in the Stinson 108 transmitted on just one frequency, almost always 3105 Khz). Just to the left of the radio frequency measurement chart is the Stinson 108 airplane Warranty (white paper with blue border). Just to the left of the warranty is the Stinson 108 laminated checklist. 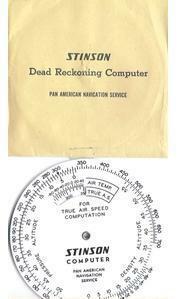 At the lower left is the circular slide rule provided by Stinson in the Data Kit. This circular slide rule is an E-6B type calculator without the wind drift capability of the actual E-6B. Note the circular slide rule I have in my Stinson Data Kit is that shown, a surplus USAAF type. Above the circular slide rule is the Safe Flight stall warning system blue owners manual, and above it on the left, the warranty for the Safe Flight stall warning system. From the factory the Safe Flight stall warning was an option available only on late model Stinson 108-3's. All the items shown fit nicely into the Stinson Data Kit envelope. It is a handy place to store these valuable documents for your Stinson 108.
of his original Stinson Circular Slide Rule. Note the Stinson and Pan American Navigation Service logos. Pan American Navigation Service was a book store, which in the 1940's was located in North Hollywood (I know they were located in North Hollywood in the early 1960's when I first visited their store). Pan American Navigation Service also published aviation books, most notably the Charles Zweng series. They later moved their book shop to Van Nuys, very near the Van Nuys airport, but they are no longer in business. My thanks to Mark Davis, at Mark.Davis@state.co.us, for providing the image of his Stinson Circular Slide Rule. Just after loosing on eBay to buy one of these circular slide rules, homepage visitor Bruce R. Plendl, at Bruce.Plendl@PSS.Boeing.com, wrote to tell me Univair has these circular slide rules available in their catalog. As it turns out they do have them. The Univair part number for the circular slide rule is 179-SWC, and the price Univair charged me is $7.00. Right now I'm quite pleased that I lost the eBay auction, I bid $35, then lost to someone willing to bid $50!! Instructions on how to use your Stinson White Computer is part number 179-SCI, and the cost is $3.92. Thank you Bruce for that information! So if you'd like one of these Stinson Circular slide rules of your own give Univair a call. Info about the availability of the slide rule from Univair added 9/05/01. 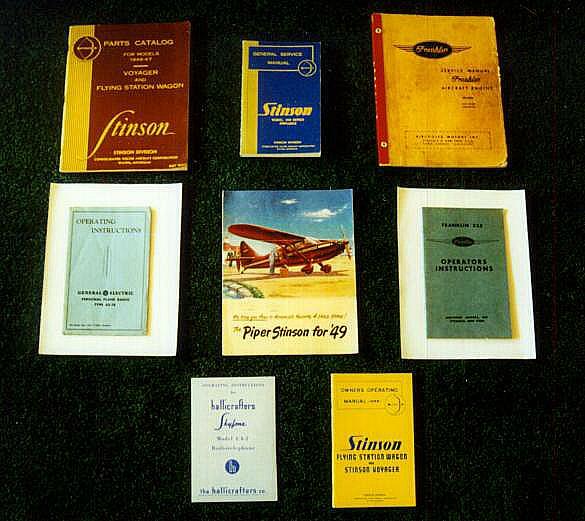 Manuals for the Stinson 108 come from several sources. 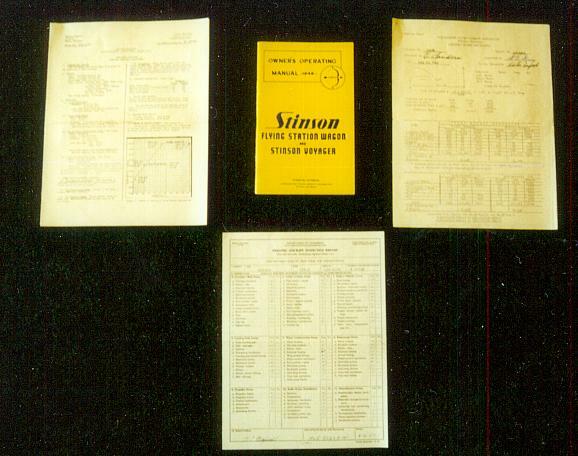 Stinson published three manuals for the model 108, an Illustrated Parts mnaual (top left), a General Service Manual (top center), and a Stinson 108 Owners Manual (lower right). In addition Franklin (Air Cooled Motors) published an Engine Service manual (top right) and an engine Operators Instruction manual (middle right). Not shown (I don't have an original) is a numeric, non illustrated, parts list for the Franklin engine. Stinson 108's were delivered from the factory with either the General Electric model AS-1B radio (model 108 only), or the Hallicrafters Skyfone model CA-2 radio (model 108-1, 108-2 and 108-3). A radio manual was included for each. The GE AS-1B manual is Shown at middle left, The Hallicrafters Skyfone CA-2 manual is shown at bottom left. In the middle of this image is a sales brochure for the 1949 "Piper-Stinson" (the model 108-3 sold by Piper after they purchased Stinson). More than 50 years have passed since the last Stinson 108 rolled off the Consolidated or Piper production line. In the period since production closed many of the original documentation and manuals have become damaged, worn beyond use, or lost. In the middle 1950's Piper sold the rights to the Stinson 108 to Univair Aircraft of Colorado. Univair continues to hold the type certificate for the Stinson 108 series of airplanes, and also manufactures FAA approved parts (with FAA Parts Manufacturing Approval [PMA]) for the Stinson 108 series airplanes. In addition Unvair publishes many of the documents and manuals shown here. If you are missing any of your original documents or manuals, contact Univair Aircraft for price and availability. They publish good quality reprints, and I used a number of Univair's Stinson 108 publications when I restored my Stinson 108. NOTE - some documents available from Univair, such as the flight manual, are purchased for a specific MODEL Stinson 108, such as a flight manual for a Stinson 108-3. HOWEVER - the flight manual must have the specific information for your AIRPLANE. You must still add the equipment list for the flight manual to be complete. Hope you find this page informative and useful. If you find errors or omissions, please contact me at westin@westin553.net.